I realize this is a bit off topic, but I thought you might give me a bit of latitude. 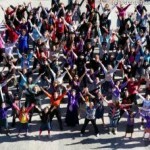 On Friday, Jan 6th, 2012, a group of 250 women from Bet Shemesh decided to raise their voices in full force against the exclusion of women from the public domain by holding a mass public dance in the city square. The women, residents of the city from all ages and sectors, religious, traditional and secular, gathered together in a flashmob dance, in the city square and started dancing towards a change. Danielle (16) and I participated and it was an amazing boost. I havn’t felt so “part of something larger” in a long time! It was great energy, a lot of fun. Just to fill you in, lately there has been a lot of negative news coming out of Beit Shemesh. An extreme faction of religious orthodox men in the city have been demonstratively belligerent to the modern orthodox community. 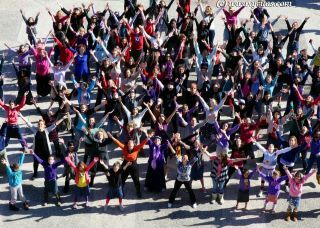 The flashmob was an expression of women in our city. It was meant to show the world there is more to Beit Shemesh than has been in the news lately. Thanks to Miri Shalem and Brenda Ganot for your hard work to make this happen.